The Persians achieved unity under the leadership of Achaemenes, whose descendant Cyrus brought the Achaemenian Empire onto the centre stage of world history. Cyrus was the descendant of a long line of Persian kings and should be referred to as Cyrus II, having been named after his grandfather. According to the writings of Herodotus, the last ruler of the Medes, Astyages (585 - 550 B.C.) was defeated and captured by Cyrus in 549 B.C.. In all probability Cyrus had the support of the Babylonian sovereign Nabonidus. The Persian king overthrew the Median empire and seized Ecbatana (Place of Assembly), which became his capital. He spared the defeated ruler, preferring not to indulge in the mass killings, which until then had been a feature of Assyrian victories. On the contrary he brought nobles and civilian officials, both Median and Persian, into the government of his kingdom. From 546 B.C., Cyrus II applied himself to the task of attacking the powerful kingdom of Lydia, where the famous Croesus ruled. There were two battles, then Cyrus besieged and captured Sardis before going on to subdue the rich Greek cities. From this point onwards Cyrus was master of all Asia Minor. He now turned his attention towards his eastern frontiers and conquered a string of provinces one after the other, even crossing the Oxus in order to reach another river, the Jaxartes, which flows into the Aral Sea. A number of fortresses were then built for the purpose of keeping out the nomads of Central Asia. In 539 B.C., the Persian sovereign assembled the bulk of his army and left his capital, Ecbatana, to follow the course of the Tigris down to Babylon, where he attacked Nabonidus. The city which had been capital of Mesopotamia for a thousand years offered little resistance, and welcomed Cyrus as a liberator. As usual, Cyrus showed magnanimity in victory. The respect he showed for the religions of others earned him the homage of all Babylonians; Syria and Phoenicia thus came under Achaemenian law. Cyrus the Great now held sway over all the kingdoms of the Near and Middle East. In the space of less than twenty years he had assembled the greatest empire the world had ever seen. All he needed now was Egypt! However, soon after his son Cambyses had been entrusted with making the preparations for such a campaign, Cyrus himself was killed in battle on the eastern frontier of his empire. When Cyrus died in 530 B. C., the Achaemenian Empire was well established. 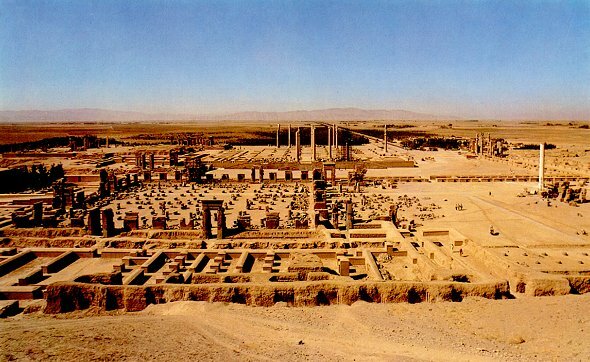 The sovereign had founded a new capital city at Pasargadae in Fars. Similarly, he had worked out the administration of the empire, appointing a governor, or satrap, to represent him in each province. He imposed an annual tax in the form of a tribute on all the races he conquered, to which the Achaemenian power owed much of its wealth and magnificence. Cyrus was succeeded by his son Cambyses II (530-522 B.C.). After a victorious campaign against Egypt, he annexed the country to his father's empire, but during his absence the throne was seized by the Magus Gaumata, and the King died mysteriously. However, Darius I (522-486 B.C.) ended this reign, when he proclaimed himself the legitimate king. He then continued the work of Cyrus, creating 23 provinces, or satrapies, and building the administrative and religious cities of Susa and Persepolis. The magnificent palace complex of Persepolis was founded around 518 B.C., although more than a century passed before it was completed. Through his military campaigns, Darius extended the frontiers of the empire; in the east, around 512 B.C., he conquered Gandhara and the Indus Valley, while in the west, he attacked the Scythians, whom he never managed to subdue, and then turned against Greece. While attempting to put down a rebellion in Egypt in 490 B.C., Darius suffered a humiliating defeat at Marathon, near Athens. He died in 486 B.C. without renewing his attack on Greece. After the death of Darius, the immense empire established under the first Achaemenian rulers was threatened, as Persian authority could no longer contain the rebellions of the satrapies. Xerxes (486-465 B.C. ), the son of Darius, put down revolts in Egypt and Babylonia with great severity and renewed the struggle against Greece. He quickly subdued Thessaly and Macedonia, then captured Attica and Athens, which he burned down; however, in 480 B.C. the Persian fleet was destroyed at Salamis. Discouraged, Xerxes returned to Persia, and never left again. Gradually, the immense empire disintegrated; the Greek cities in Ionia, Egypt, then Pheonicia and Syria broke away, followed by the regions to the west of the Euphrates. Artaxerxes III (358-338) made one last attempt to reunite the empire, brutally taking back Egypt and quelling the revolt of the satraps, but a new power was already emerging in West-Macedonia. The last Achaemenian ruler, Darius III (336 - 330 B.C.) was weak, and his cowardice at two major campaigns, the first at Issus (333 B.C.) and the other at Gaugamela two years later surrendered the empire to Alexander. "Cyrus the Great, The Phenomenon"